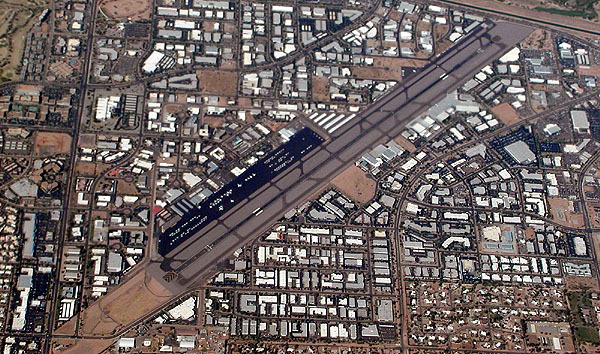 Scottsdale Airport is located in Scottsdale, AZ, 22 miles Northeast of Phoenix. From PHX take Loop 202 East to Loop 101 North, and go West on Cactus Road (or any major road) to Scottsdale Road. Drive North on Scottsdale Road to the airport entrance. Or take I-10 North from PHX to Highway 51 North to Thunderbird Road. Go East on Thunderbird Road to Scottsdale Road North to the airport entrance. Scottsdale Airport is home to numerous light aircraft and many business jets. There are many aviation related business located on the airfield. Small charters and sightseeing services are available. Scottsdale Airport is home to the CRM Aviation Training Center, formerly Sabena Airlines Training Center. Pilot training for several airlines takes place here, and the training aircraft can be seen around the airfield at times. Many corporate jets can be seen here at Scottsdale, especially during the winter months. The airport has hosted several airshows over the years.